Vail’s Lindsey Vonn was just one one-hundredth of a second off the pace of Switzerland’s Lara Gut in a super-combined event at Val d’Isere on Friday, winning the downhill but coming up short in the slalom — an event she’s only trained for twice this season. Vonn increased her lead in the overall World Cup chase to 122 points over Gut, who leapfrogged Vonn’s teammate, Mikaela Shiffrin. The Eagle-Vail native returned home for the holidays to rehab a knee injured in a training run at Are, Sweden. Shiffrin is not sure when she’ll be able to return to the World Cup circuit. VAL D’ISERE, France (Dec. 18, 2015) – Lindsey Vonn (Vail, CO) just missed the top step of the podium by the smallest of margins, finishing second to Switzerland’s Lara Gut in the Audi FIS Ski World Cup alpine combined Friday. Vonn led the way in the morning downhill, taking a 0.38 lead over Gut into the afternoon slalom. However, Gut nailed the top portion of the slalom course to pull into the lead. 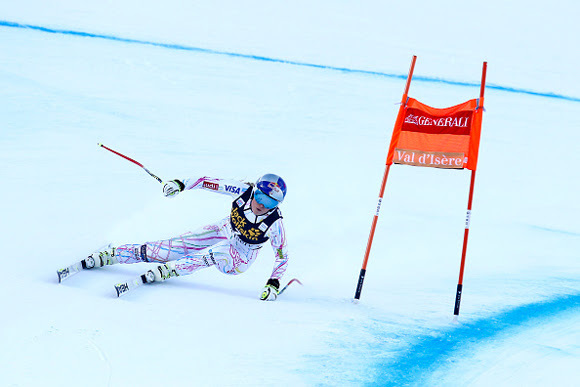 With only two days of slalom training this season, Vonn saw her advantage slip away on the upper portion of the slalom course, before letting the skis run on the bottom and almost pulling off a the victory. She crossed the line just 0.01 off Gut’s winning time. Austria’s Michaela Kirchgasser rounded out the podium in third. American’s placed three others into the top 30 Friday, including Laurenne Ross (Bend, OR) finishing 15th, despite dislocating her left shoulder and suffering whiplash in a downhill training run finish line crash Thursday. Jackie Wiles (Aurora, OR) posted a career-best Alpine Combined World Cup result in 25th, and Stacey Cook (Mammoth Mountain, CA) finishing 28th. Up next, the women compete in downhill Saturday at Val d’Isere at 10:30 a.m. CET and giant slalom Sunday in Courchevel, France. Lindsey Vonn (Vail, CO) was second in the women’s alpine combined at the Audi FIS Alpine Ski World Cup in Val D’Isere, France. With her second-place finish, Vonn continues to lead the women’s overall World Cup standings. Jackie Wiles (Aurora, OR) posted a career-best alpine combined World Cup result in 25th. All American women were top 10 in the downhill portion of the combined. On the top, I definitely felt the aggressive snow. It took me a while to get into the rhythm of everything. Then, once I hit the last flush coming into the flats I felt better, but then I got hung up maybe three gates from the finish. I could analyze myself all day long and I could find a hundredth on every single turn, but I gave it my best shot, and considering how much slalom I’ve trained, which is pretty much nothing, I think it was a really good performance. So, I’m happy with it. Maybe one hundredth faster would’ve been nice, but you win and lose by hundredths all the time, so it’s just part of the sport. It was definitely painful today. Getting out of the start was really hard. It definitely gave me a bit of confidence and reminded me of how fast I can ski. It was exciting to have a good run. I was a little tentative on the top of the turns in some areas, so I really had to stay solid and get the ski to bend for me. This gives me a lot more confidence heading into tomorrow. Now that I know I can do it, I’ll push it a little bit more.